This tutorial shows how to configure Zimbra Collaboration Server (ZCS) and Samba to act as a primary domain controller (PDC) that uses LDAP as a centralized database for authenticating users on Linux and Windows desktops. It should enable you then to seamlessly integrate Zimbra into a corporate network based on Open Source server software. You can then use Zimbra Admin GUI to manage Samba accounts, groups and domains. Before we start I want to say first that this is not the only way of setting up such a system. There are many ways of achieving this goal but this is the way I take. I do not issue any guarantee that this will work for you! Now you will need to have a DNS server before doing any step, if you don't have a DNS server you can have a look on that tutorial. Why did I use Ubuntu 6.06 LTS? unfortunately so far Zimbra provides a package for Ubuntu 6.06 LTS and not 8.04, you can download Zimbra source from other community groups which is modified to be installed on Ubuntu 8.04 but I just preferred to go with the officially supported version, for samba it doesn't really matter as it's a different server but I used 6.06 also in this tutorial. Steps 1 to 5 need to be done on both servers Zimbra and Samba! I won't go through this part in deep details but all what we need to do here is to install Ubuntu 6.06 LTS, basic installation with nothing on it, it's important to make sure you have the correct IP configuration during the installation so that the sources.list file (used by apt-get) will be correctly configured, other wise we will need to configure it manually. A small tip: if you see the following screen before your IP configuration then you have already passed the IP configuration it's recommended to press <Go Back> and choose configure network manually. After that carry on with the installation normally and make sure you have an internet connection configured. After the reboot you can log in with your previously created username (e.g. administrator). Because we have to run all the steps from this tutorial as root user, so we will enable the root account now. 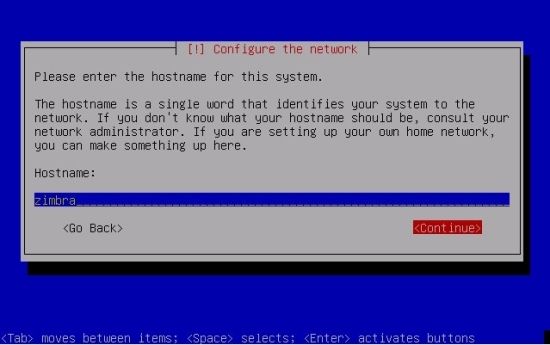 From now on you can use an SSH client such as PuTTY and connect from your workstation to your Ubuntu server and follow the remaining steps from this tutorial. The IP Address below will depend on which server you are installing, my sample below is for my Zimbra server. Please make sure your network configuration are set correctly, feel free to change that based on your network configuration. Both should show zimbra.tm.local now. You need to redo Step 4 with the Samba Server. Note: You don't need to enable the universe repository on the Zimbra server, however it's required on the Samba server. to install the latest updates (if there are any) then reboot. Steps 6 and 7 to be done on Zimbra server! You will have to type your real domain name which in our case tm.local and press Enter, and if your DNS is correctly configured you wont see any other DNS errors. Type in 3 and press Enter. Type in 4 and press Enter. Now you need to enter a new password for [email protected], I will configure my password to be howtoforge. Now type a to apply changes and press Enter, everything else should then go with the defaults and the logical answers. Ok now Zimbra is up and running, for testing you can try to access: https://192.168.0.107:7071/zimbraAdmin/ (change the IP to meet your server's IP) and log in with admin and the password you have configured during the installation (in our case howtoforge is the password). Now you need to note down what is the LDAP password as we will need it during Samba installation, during Zimbra installation a user called zimbra is created, most of the zimbra commands can only be executed under the zimbra user, to switch to the zimbra user run the following as root. So your password is 6Rf8hUwL, it is a random password so you may get it differently. Our Mail Server (a Xen virtual server) was acting up yesterday. We could send email internally and also receive email from external source but if anyone outside of our company would send an email to any of us, No One could get that email?! I Looked in all the log files and all over the Net for the similar problem but any way the problem was not related to DNS or DHCP But the CLAM (The anti virus/virus-checking program). CLAMD was taking up too much memory. The problem was due to lack of memory assigned to the Virtual machine changed the Config files on the Host Server (for the guest/mail server) and Reconfigured Clamd to be a little less dumb and every thing was working fine. messages in queue but not yet preprocessed: 0 "
This might be an obvious question, but why have two separate servers? Couldn't you do it all on one server? I would like to know if I could do one server that had DHCP, DNS, SAMBA, and Zimbra, all one server.